Christine Vandenhouten received her BSN from Marian College, Fond du Lac WI, her MSN from the University of Wisconsin Oshkosh, and her PhD in Nursing from Marquette University, Milwaukee WI. She worked as a professional nurse in the neonatal intensive care (NICU), perioperative (surgery), and public health settings. She has over 25 years of experience as a nurse educator at both the undergraduate and graduate levels. She led a travel course to Mexico where students examined the rich language and culture while studying the Mexican healthcare system. Areas of expertise, teaching and research include program planning and evaluation (both community and educational systems), community organizing, health system leadership, healthcare policy, credentialing, public health, and political advocacy, global health systems, and cultural competence in healthcare. Dr. Vandenhouten serves on the Board of Directors for Bellin Health Systems and the Northeast Wisconsin Area Health Education Center (NEW AHEC). 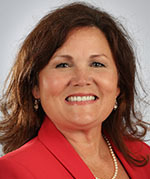 She also has a long history of service to the United Way of Brown County having served as the chair of the Health and Wellness Impact Council (past) and now the Community Impact Council charged with distributing program funds. She also serves on numerous community action teams/boards including the Oral Health Action Team designed to address oral health access issues for residents of Brown County. When not teaching, Dr. Vandenhouten enjoys spending time in her flower gardens and in northern Wisconsin where she enjoys fishing in the summer and outdoor sports like cross-country skiing in the winter.